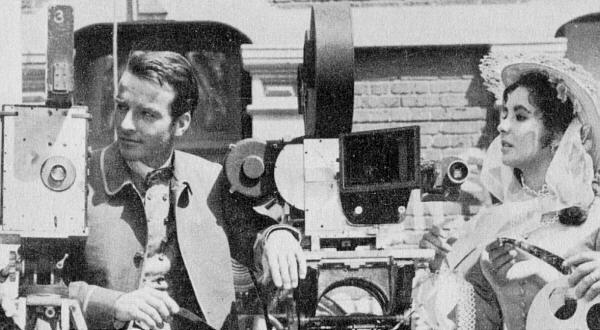 Raintree County director Edward Dmytryk is seen with an unsilenced MGM Camera 65 unit on a Chapman Crane. The camera is a Mitchell and was most likely one of those acquired by MGM in 1930 for their 70mm Realife process. Mitchell converted these cameras from 70mm to 65mm for the Ultra Panavision/MGM Camera 65 project. 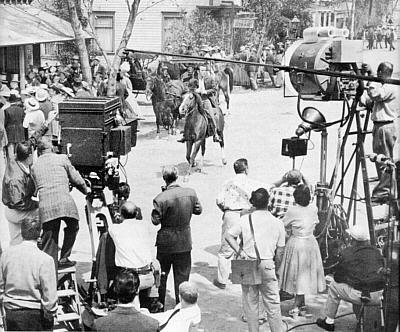 Panavision also commissioned Mitchell to build two new 65mm cameras for the system. It is quite likely that these cameras became the basis for the Mitchell FC/BFC series that were adopted by Todd-AO and first used on South Pacific in 1958. 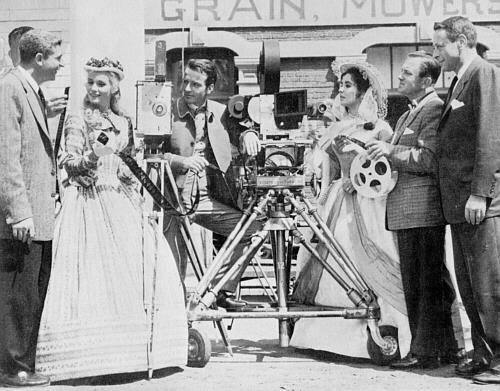 Montgomery Clift and Elizabeth Taylor seen with MGM's first camera (left, in case you couldn't tell) and the "new" MGM Camera 65 with its distinctive prismatic anamorphic lens. Setting aside the motor and large lens, the two cameras are not significantly different in size, but the Camera 65 would swell to monumental proportions when mounted in the sound proof blimp. 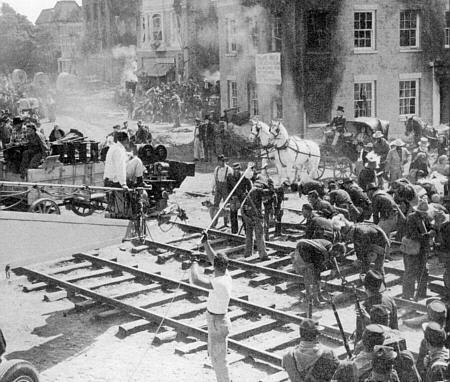 The full photo of the cast and crew posing with the camera and comparing 35mm versus 70mm film is seen below. Liz seems to be saying, "My husband's is just as big." You will note that Eva Marie Saint is the only one in the group that is properly handling the film, holding it by the edges and wearing cotton gloves. 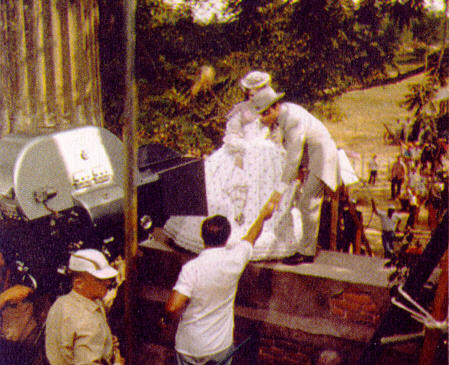 Above and Below: Camera 65 in the first sound blimp, which gave it an appearance similar to a blimped Technicolor camera or a small freezer. The nameplate on the front of the blimp may have contributed to some of the confusion over what the system was called. 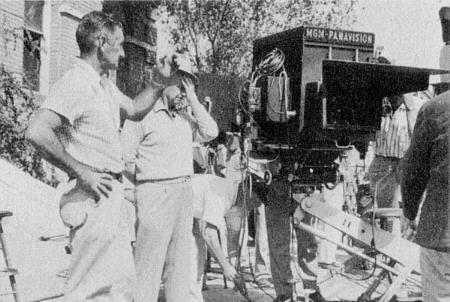 Some sources referred to it as "MGM Panavision" in early reports. Director of photography, Robert L. Surtees seems not to be having fun in the lower shot. Such attention to detail. Too bad the final film wasn't better. 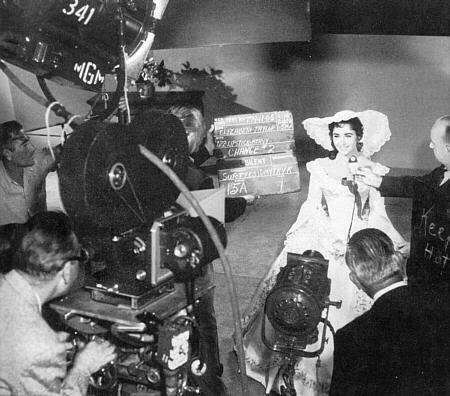 Liz doing a makeup test in the MGM Culver City studio. That's Mr. Surtees holding the light meter. 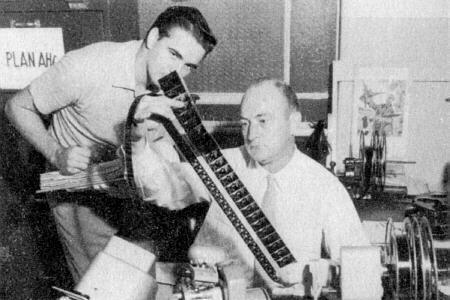 Film editor John Dunning, ACE, and assistant Jerry Brady pretend to be comparing 35mm and 65mm film.